University of Massachusetts Press, 9781625344205, 192pp. In astronomy, the termination shock is the boundary that marks the outer limits of the sun's influence -- the ripple outward of our solar wind and its collision with the interstellar medium. This debut collection of stories evokes those moments when lives are unpredictably shaken and reset by forces beyond their grasp. Making use of a diverse array of narrative modes, settings, and voices, these stories traverse space and time, moving from Egypt during the Second World War to modern-day Liberia and an unfamiliar Los Angeles. 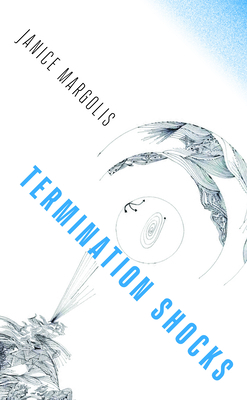 The title story, "Termination Shock," offers a lyrical exploration of two traumatic moments in a woman's life that occur decades apart and continue to reverberate in humorous and poignant ways. Janice Margolis shows us characters on the precipice of change -- including a narrator in fevered quarantine following the death of her mother from Ebola, a cross-cultural love in a swiftly transforming Syria, and the desolation of the Berlin Wall, which from its various sectors and coordinates, confesses its crimes and mourns its destruction.